VisionTrak gives you the power to track precisely what a person is looking at. Available in head-mounted and desktop versions, VisionTrak collects pupil size, eye movement and eye point of regard data, recording in real time without restricting head movement. Maximize your vision tracking and analysis capabilities with VisionTrak.The VisionTrak Standard System is a turnkey solution that allows unrestricted head movement. A transparent mirror mounted in front of the subject's eye reflects the eye image into a head mounted video camera. A single LED provides safe, low level infrared illumination. This system is widely used for simulation applications like driving, pilot evaluation and training. It's also perfect for retail merchandising research, drug and alcohol response testing, and vision research. For a PDF of the brochure with full product specifications, click here. This system allows the subject to be seated comfortably without using a chinrest. Both eyes are viewed using a specialized remote infrared (IR) video camera system. The VisionTrak Binocular Desktop 300 System is ideal for a range of applications including vision research, ad and web effectiveness studies, and reading and language evaluation. 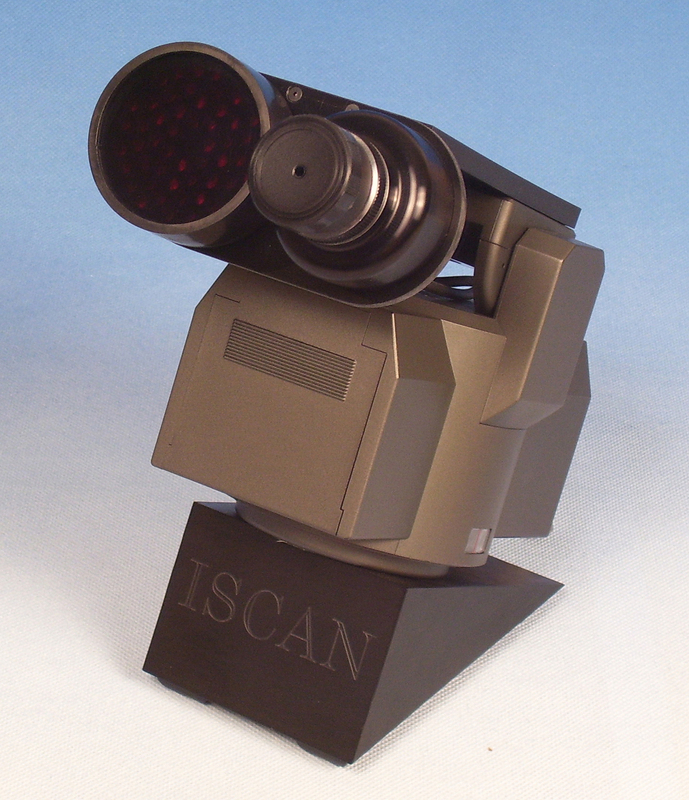 Developed by ISCAN, Inc.,VisionTrak delivers the power of real time tracking along with unrivaled ease of use. System calibration, software and data acquisition are all easily controlled from the operator's PC. Calibration is simple and fast, requiring as few as five calibration points. VisionTrak incorporates miniaturized electronic and optical components that create crisp, clear eye and scene images. The images are conveniently displayed in the streamlined graphical user interface (GUI) on the operator's PC. The object that the subject is viewing is clearly identified by crosshairs instantly superimposed over live imagery. VisionTrak's advanced eye tracking processor automatically tracks the center of a subject's pupil and the reflection from the corneal surface, measures pupil size and collects a variety of additional data. Crosshairs automatically center over the pupil and corneal reflection to indicate proper tracking. VisionTrak functions perfectly in virtually any lighting condition, even if the subject wears glasses or contact lenses. VisionTrak's included Raw Eye Movement Data Acquisition Software (DQW) for Windows® XP, is easy to use for a wide range of applications and environments. Eye imaging and tracking data can be viewed and collected in real time for analysis and export. Pupil diameter, eye fixations, velocities and accelerations can be further analyzed and quantified to user-defined criteria. then output in a variety of convenient reports for final presentation. VisionTrak is available in a variety of system configurations to meet your tracking needs. The Standard Head Mounted Eye Tracking System and the Binocular Desktop 300 System are supplied with a pupil and corneal reflection tracking system, eye imaging system, computer, keyboard, mouse, monitor and the above DQW software. The Standard Head Mounted Eye Tracking System also includes an auto-calibration system and eye and scene camera control unit. The Global System includes everything you get with the Standard Head Mounted Eye Tracking System and more. An additional camera provides a wider field of view, capturing an image of both the subject and the scene. A 9" black and white monitor is supplied to display the extra image. The Global System includes a Polhemus 6 Degree-Of-Freedom (6DOF) FASTRAK system to enable simultaneously eye tracking and head motion. Supplied applications include Line of Sight (LOS) software, which combines eye and head vectors for point of regard output, and Point of Regard Fixation Analysis (PRZ) software, which enables advanced analysis of raw point of regard data. 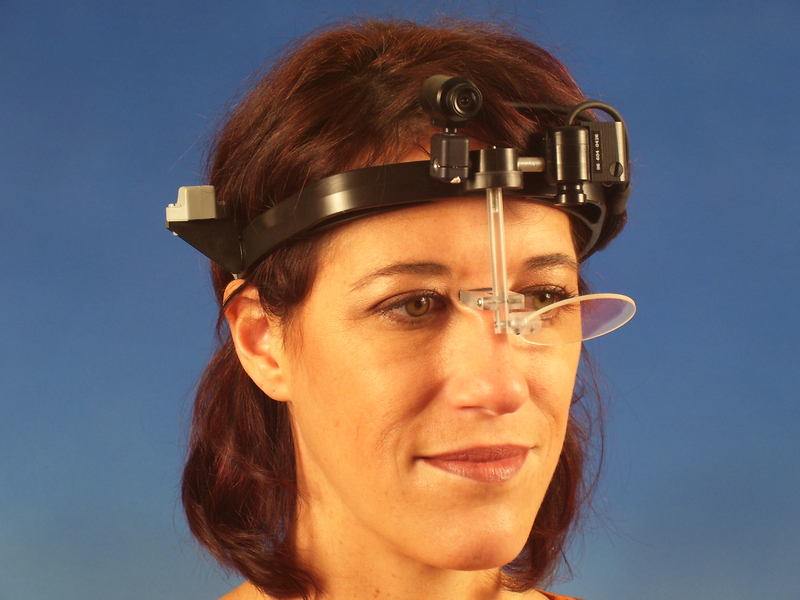 An add-on for the Standard Head Mounted Eye Tracking System, the Remote Digital Recording System is worn by the subject to facilitate untethered movement during tracking. All data is captured to Hi-8 media and can later be uploaded to the operator's PC. The Remote Digital Recording System includes a Hi-8 camcorder, 2 channel MUX and DEMUX, power vest, spare battery and charger.